There is no shortage of shooters in the video game market today. Most of them being war or space-themed, first person shooters; none of which I’ve been a huge fan of. However I’m always up for a spaceship-shooter or dogfight-like game, and Thorium Wars: Attack of the Skyfighter is one in that genre. 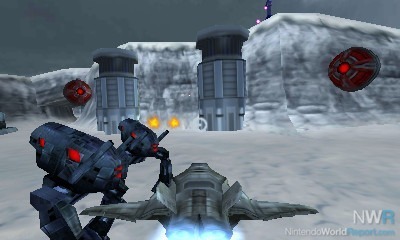 Attack of the Skyfighter is a sequel to the DSiWare game, Thorium Wars. The story in Attack for the Skyfighter is pretty typical for a space-shooter; your goal is to eliminate the war-machine race of Thorians. Nothing special; you definitely won’t remember this game for the story. The controls are clearly explained in the first mission, which is good because you use most of the 3DS’ buttons in every battle. You can choose from multiple ships at the beginning of the level, each with different stats such as speed and armor. There are two types of weapons, one that rapidly fires the lasers, and one that works as a more powerful single-shot laser that you can charge to make it stronger. Just be sure not to overheat your guns. Then we have the speed control. You can go at a normal speed as well as boost and brake, which is important to use correctly so you don’t run your ship into a wall. The graphics are solid for an indie game. They won’t win any awards for it, but for an indie game studio working on a 3D space-shooter, it looks nice; plus the 3D is impressive. The music is great; the people at Big John games captured the epic space-shooter feel very well, and it’s great to listen to while chasing down an enemy. You will navigate through caverns half the time, and at the beginning it’s a bit dull; but in later missions you will have to avoid lasers and walls, which makes these otherwise dull sections fun and challenging. When you’re not navigating caverns, you’re most likely in an open area where there are enemies to fight. Some are in the air and some are on the ground or on walls. This is the other half of the game, and is enjoyable to play. I have a few problems with Attack of the Skyfighter. First, it seems like if you have any contact with an object, even the slightest bit, your ships will explode and you get a game over. Luckily checkpoints are pretty common so getting a game over isn’t torturous. Second, the game plays slow. I was expecting the game to be a little faster than it was, more along the lines of Star Fox Command. However this might mainly be because of the fact that I used the slowest fighter in almost every mission; so take that with a grain of salt. Third, the game is unusually short. After less than three hours I had finished the game. Needless to say I was highly disappointed in the lack of length in an otherwise great game. 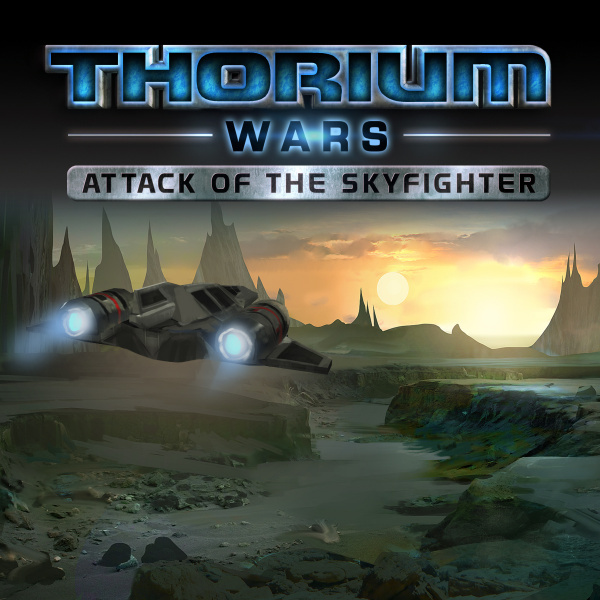 Thorium Wars: Attack of the Skyfighter is an enjoyable space-shooter experience that has a lot going for it. Solid indie graphics, excellent music, and quality gameplay; at $8, I would suggest this to any space-shooter fan that is looking for a good eShop title, or anyone who is curious about it. Just don’t expect it to last too long. Awesome review as always! I really appreciate your contributions to our website. I enjoyed the first game, and this sequel sounds even better lol. I forgot to mention what I thought about your review lol. @Rukiafan no problem! I love writing reviews for this site. Sweet review! This is a must buy for me, but it'll have to wait until my wallet is a little fatter! @Staroceancrazy wrote: Less than 3 hours? That's longer than Star Fox 64! You must not like NES games then. How big is download file? Nice review as always Gamergy! @Midnafanatic wrote: How big is download file? Thanks for the support on the review everyone! Your reviews are quite popular. They seem to receive alot more hits than mine do. Congrats! You review is spot on! I like Star Fox so I might give this game a chance.